Home » Blog » Dreaming of the Ideal Bedroom? We can help. Country French Bedroom. Coverlet, king shams, swags and cascades over roman shades. Bergere chair upholstered in same fabric as swags. Decorative pillows. 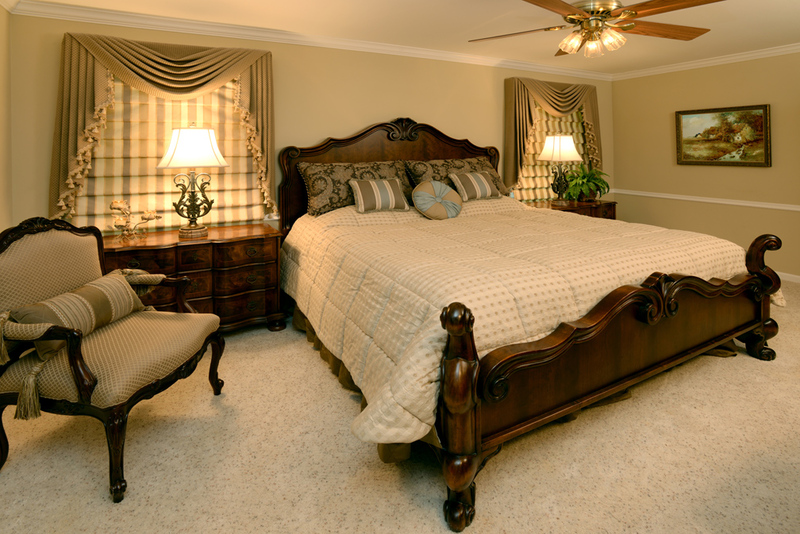 You deserve a bedroom decorated in a style that reflects your tastes. The furniture should answer your needs – a bed, nightstands, dresser and chest to give the room definition and functionality. 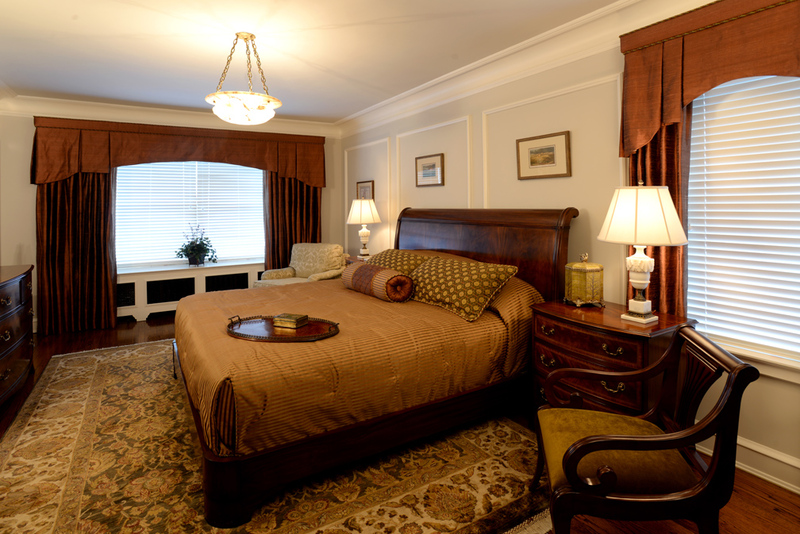 Complete the picture with a luxurious bedspread and pillow shams, stylish draperies and shades. They all work together to create a beautiful surrounding and give us pause to reflect and enjoy the days’ achievements. If you need help designing and furnishing your bedroom suite, call Sibrava & Associates Interior Concepts today for your one-of-a-kind room design. 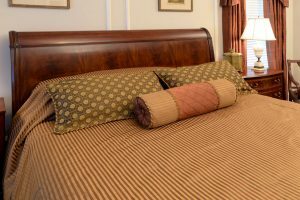 We will coordinate furniture selections with a custom made bedspread, dust ruffle and window treatments selected for your discerning tastes. We are specialists in designing space plans and coordinating furniture selections and fabrics to create a layered, fashion-forward design statement for your bedroom or any room in your house. Master Bedroom. Henkel Harris mahogany bed, nightstands and chairs. Oriental area rug adds pattern and colors to form basis for fabric selections. Bedspread, duvet, or coverlet. Many styles and quilt patterns. Dust ruffle or Flounce – Tailored, Shirred or Pleated. Pillow shams and Bolsters – Cord edge, Ruffle or Flange edge, Shirred or Braid Cord Edge…the options will amaze you! Neck Rolls and Throw Pillows – Round, Square Cords, Bows, Ruffles, Flanges, Fringes, Cords, Tassels, you name it, we can do it. Stars and Heart Shapes too. Chair pads, Bench pads, Window seat pads and Benches help to customize your accessories. Upholstered Headboards, Room Screens, and Table Covers could be finishing elements that add style and context. Master Bedroom Suite, Bed dressed with fitted Coverlet, Pillow Shams and Neck Roll. Combination of fabrics and trim add accents to pillow edges. Colors carry through to draperies. Visit our website today. View our Portfolio of Designs. Sign up for our occasional emails. Use the Contact Us form to request an in-home consultation.